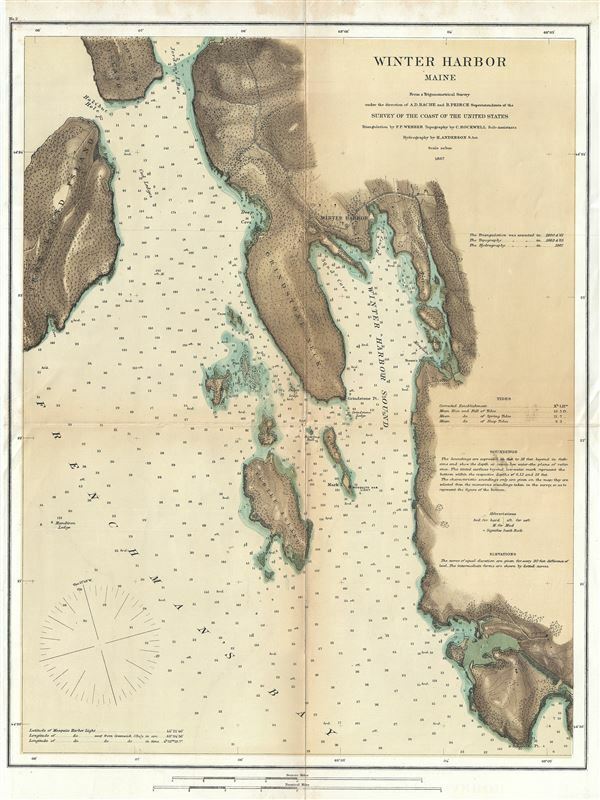 This is an uncommon 1867 U.S. Coast Survey map of Winter Harbor Maine. The map covers the eastern shore of Frenchman's Bay and Winter Harbor Sound from Jordan's Island, Halibut Hole, and Iron Bound Island eastward as far as Mosquito Harbor and south to Schoodac Point. Includes the town of Winter Harbor, which was named for the fact that this sheltered sound does not freeze over in the winter months. Winter Harbor is located just eat of Bar Harbor and Mount Desert Island. This coast chart is unusual in that it was printed in color on high quality paper, making it one of the earliest Coast Survey experiments in chromolithographic printing. The triangulation for this chart is the work of F. P. Webber. The topography was completed by C. Rockwell. The hydrography was accomplished by H. Anderson. The whole was prepared under the supervision of A. D. Bache and published by his successor Benjamin Pierce. Very good. Minor wear and verso repair along original fold lines.